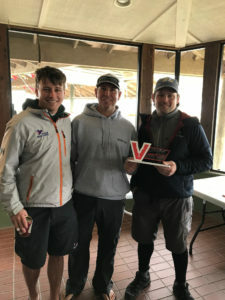 Narrowly escaping the snowstorms ravaging across the northern parts of the continent, 22 Viper teams had a great time in Sarasota for the 2nd event of this years Winter Series. The same cold front which was causing power outages and car crashes on slippery roads up north presented two days of breeze-on conditions on Sarasota Bay. 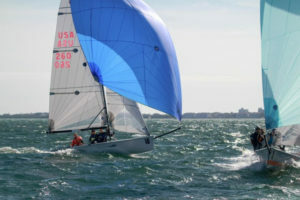 Saturday’s forecast of 12-15kts immediately looked conservative as the fleet bore away from the Sarasota Sailing Squadron docks, hitting speeds of 10kts under jib and main on the way to the racecourse. The southerly breeze made for some great racing on Saturday. The 2 ft chop and 20kt+ gusts saw many different approaches to upwind and downwind speed on the racecourse. While hard hiking and flat hull trim always pays dividends, it became immediately apparent that some techniques were better than others. Floor Muffin, being sailed by Zeke Horowitz (2018 Rolex Sailor of the Year? ), and brothers Geoff and Nick Ewenson looked extremely fast during race 1 as they fended off the lightweight Jackpot team of Brad Boston, Lee Shuckerow and Pete Pete (Peterson) and the dialed in It’s all Good team led by Jay Golison. 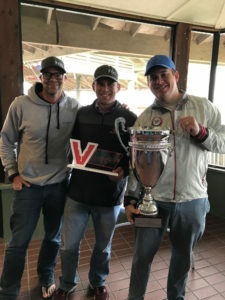 As the wind built and races 2 and 3 were sailed, the competition between the top boats became even more intense as Marcus and Andrew Eagan, sailing with Andy Horton on Cajun Underwriting began to figure out the next gear upwind. Sailing with an in-column rig, tight headstay and looser (than most) gnav, Cajun Underwriting had serious upwind speed, negating the 17kts of downwind boat speed of Jackpot and Floor Muffin. Throughout the rest of the fleet, the racing was intense. When the Vipers get planing in 20kts of breeze, huge gains and losses can be made on the downwind legs. As the day wore on, with the breeze building and teams getting more tired, broaches became more common on the racecourse. If you found yourself in an overly aggressive gybe or a bit too over stood coming into the leeward gate, a roundup on the next wave often ensued. Backwinding the jib and getting the bow pointed downwind brought boats back onto their feet quickly, but with the finishes being decided by seconds, these mistakes were costly in the standings. Likewise, even finding parts of the racecourse with more breeze downwind would pay huge dividends. It wasn’t uncommon to see a downwind boat taking a flyer to the other side of the racecourse make up 30+ boat lengths just due to increased pressure, which very readily translates to increased speed on the plane. With most of the fleet in good shape after three races, but getting tired from a days’ worth of work, there were no objections to sailing in for a delicious BBQ and beer at the Squadron. Arriving at the club Sunday morning, it became apparent that the cold front was still seriously affecting the breeze on the bay. Now a brisk northerly was churning down the bay at 24+ kts, building waves all the way from Bradenton. After the fireworks, fun and impeccable race management by Eric Robbins (PRO) and Judy Hanlon (PRO-assist and Judge) on Saturday it was no surprise they cancelled things on Sunday, cementing the weekend wind for Cajun Underwriting, which beat Floor Muffin (2nd place on tiebreaker) and Jackpot by a single point. After congratulations were had in the clubhouse, a few folks in the Viper fleet decided to have a little fun in the breeze, which was now gusting in the 30+ kt range. Dave Hillmyer was first to leave the beach, getting in a little time away from Sidewinder to work on his Laser. Close behind was the team Meow!, who were motivated by their fearless 16 year old crew Aden, who needed some good sailing content for his burgeoning YouTube channel. Out in Sarasota Bay, Meow! pounded upwind, with the jib being eased along with the main over the 3 foot steep chop. Turning downwind was a tad difficult: the first time, the bow actually buried in a wave all the way up to the mast. However, once the kite was flown, the hollering and fun began as the boat surfed and jumped waves at 17 kts of boat speed. After a good 2+ mile spinnaker run, Meow! had her fill and decided to head back to the club to pack up after another epic weekend in Sarasota. Check out Aden’s headcam from Sundays spinnaker run! There’s one more chance to join in on the action in Sarasota, as the series concludes February 9th and 10th. There’s still time and room to join in with the 29 Vipers registered, feel free to sign up today! Following Sarasota, the fleet is excited to continue the southern circuit in the 1st week of March at the Winter Cup and Bacardi Invitational in Miami, followed by Charleston Race Week and Annapolis on the migration back north for the summer sailing season. 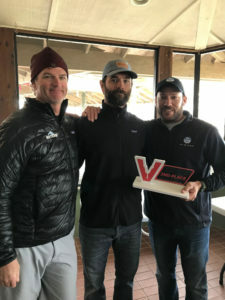 The Viper Winter Cup – March 3-4 Information and Registration HERE. The Bacardi Invitational Regatta – March 6-9 Information and registration HERE.